Wow, where did April go? It seems like I was just wrapping up our 2016 taxes, and now it’s time to write up one of these monthly reports. The year 2017 is now a third complete! Thankfully, the Pacific Northwest has finally started it’s drying-out cycle, so we’ve started spending more time outdoors. This means daily walks through the neighborhood, playground time with the kids, and more time spent in the garden. Expect me to be around the computer a little less — My replies to your emails and comments will probably slow down during the summer months. In winter (the wet season) it can rain every-single-day for a month. In summer (the dry season) we often don’t see rain for a month (or longer) and temperatures in the low 80’s. Our garden is just beginning to show signs of life, but May should really kick things into high gear. Newly planted green onions from kitchen scraps just starting to poke out. Our family tries to be Economic Gardeners, so we store water in rain barrels during the wet season, and use it again during the dry season. The rain barrels are now full, and I’m ready for some the sunshine. This helps us save a little money in the garden, but we always end-up needing extra water when mid-summer hits. 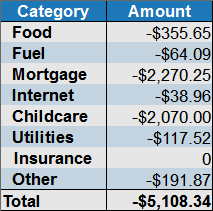 Expenses for April amounted to $5,108.34. This was actually our best month of the year so far! The Food category came-in significantly lower than usual in April. I’m not sure what happened, but instead of spending $500 on food, we only spent $355.65. We ate normally, and we happened to spend considerably less! Win! This amounts to $88.91 per person for the entire month of April. This might be some kind of record for us. Internet expenses were also slightly lower than usual in April at $38.96. My internet expenses were supposed to be going up by $10 per month, but instead they went the other direction. Why? Well, I’m sorry to say that Comcast made some mistakes. Words were had over the phone, and the result was a correction of the mistake and a $10 credit to my account. Thanks for screwing up Comcast! The Other category was $191.87 in April. Essentially there were two major expenses — some additional passport fees for the kids, and a bunch of small Home Depot expenses necessary to change out the dining room chandelier. 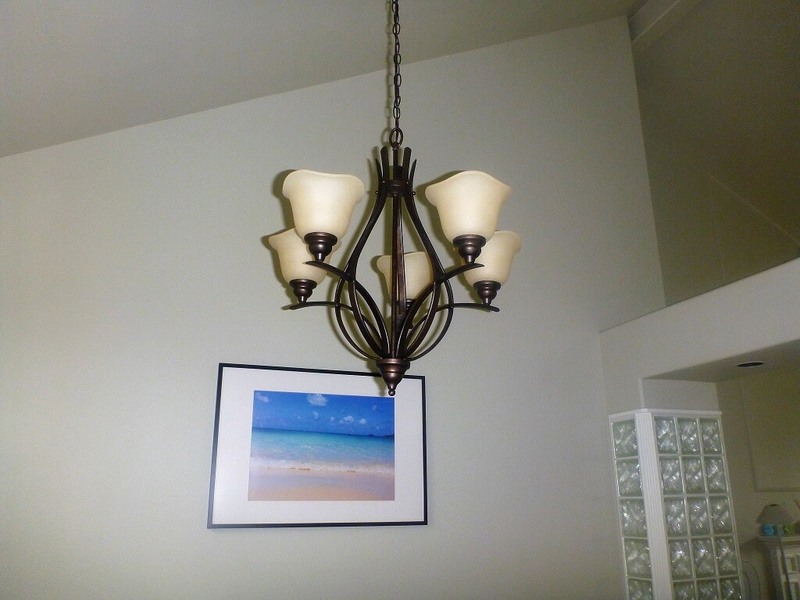 We swapped-out the chandelier from a very ugly 80’s fake-gold color, to a more contemporary dark-brown. The “new” chandelier was given away freely by our local Buy Nothing group. All it took to install was some wire, chain, new light bulbs, and a very tall ladder. Our “new to us” chandelier in the dining room. Installing it took a few parts from the hardware store, but the chandelier itself was free. Childcare and Mortgage expenses were unchanged for April, at $2070 and $2270.25 respectively. We consider these costs entirely optional in our monthly expenses because we could eliminate them at any time — I could have the kids home with me 100% of the time (I’d probably never have time to blog anymore), and we could pay off the mortgage at any time. For the year, our expenses totaled nearly $22k. This is higher than last year, but not unexpected. While Mrs. Tako continues working, we elected to put the kids in daycare part-time. This gives them plenty of time to socialize with other children, and gives me a sanity-break. Without the daycare expenses, net expenses for the year would be $8280 less. 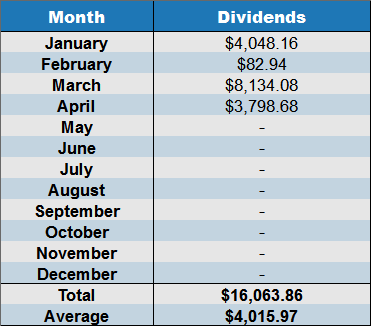 Dividends for April were $3,798.68. Remember: These are dividends only from our taxable accounts. As I’ve mentioned in previous months, we’re not utilizing dividends from our tax-exempt accounts (401k’s, IRA’s, etc). Instead, we’re letting those accounts continue to grow while we live off our taxable accounts. Our dividend goal for 2017 is to grow dividends by at least 10% to $52,000 for the year. It’s probably too early to tell if we’ll make this goal or not. Now for the portion of this monthly report I’m dreading — The Sleep Experiment. As I wrote about back in March, I’m a absolutely terrible sleeper. I probably average somewhere around 4-6 hours of sleep per day. It’s probably not very good for my health. So, I decided to trying to tracking my sleep habits and improve my sleep hygiene this year by setting some goals. Sleep a minimum of 7 hours per day. Get to bed by 1AM (or earlier) every single day. How did I do in April? Well, not so good — I met this goal only 8 nights out of 30. Yep, still terrible! But better than I did in March. It’s a step in the right direction! Having the kids now (mostly) sleeping through the night is a HUGE help, and I already feel more rested … except for last night. Our oldest son woke-up at 3am complaining of scary dreams. Daddy Octopus came to the rescue of course. Reaching my sleep goals is going to be challenging, but I’m making an effort! Sleep is important! As promised in last month’s report, there were portfolio changes in April! We purchased shares worth $84,933.73 in two existing holdings. Yes, we do have a lot of cash sitting around doing nothing, so I was glad to put this money to work. I expect to see dividend payments improve in June because of this investment. What did we invest in? LyondelBasell Industries (LYB) and our favorite, the Well-Known Energy Company (WKEC). LyondellBasell composes roughly 11% of our taxable portfolio, and it’s a company I continue to like. The company is a large global chemicals business (mainly plastics), that’s sensibly managed. They pay a solid and growing dividend in a industry that continues to see solid demand growth around the world. LYB is a value-priced stock, but when shares go further on-sale, we try to buy more. This happened in April. In April, our stock purchases of the Well-Known Energy Company (WKEC) continued, and NO I’m not giving up the real name yet. We’re still purchasing shares, and I’m still keeping quiet. Uh-huh. The difference is, instead of talking about making big investment moves, I’m actually doing it. This investment is a Big Bold Bet for us — it composes roughly 30% of our taxable portfolio. Why such a big bet? The world is a rapidly changing place. Make certain you understand how it’s changing. Hint: I read www.eia.gov almost religiously. Lots of good factual data there. 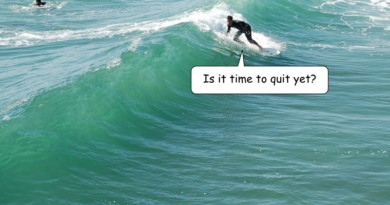 When Is The Best Time To Quit Working? Congratulations on a good spending and expense month, Mr. Tako. I’m going to give the exciting website http://www.eia.gov some attention–I’m not planning on making individual stock investments but you got me with “The world is a rapidly changing place. Make sure you understand how it’s changing.” Hope this month brings more sleep for you! OK this is quite annoying, you are one out of zillion bloggers out there who wrote about stocks except none of them has this WKEC crap like you, is it a God given secret or some kind of a bait? If not then why reveals LyondelBasell Industries but not this energy company? I like reading your articles, except when you mention this stuff. Talk about it like you really mean to, or put it under your mattress please. Well, it certainly wasn’t my intention to annoy you Jim. It’s a personal preference about what I choose to reveal (or not). It is worth a mention to me because it is valuable to see how you diversify or don’t. Thank you and will remain curious. Sounds like a great month for the food budget! Childcare in your area seems to cost almost the same as in mine. But I guess there’re things we just need to spend money on to keep a normal life. Yeah, I don’t track the food expenses close, so it was a surprise! I told Mrs. Tako, and we both kind of shrugged our shoulders…neither of us could explain why it was $150 less! It looks like you had a good April. 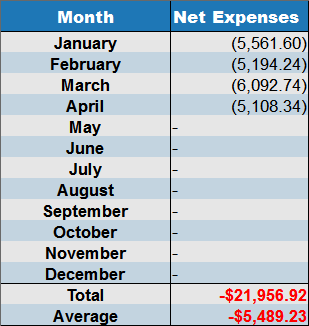 Our expenses were about $7K USD and dividend income was at $6703.63 so a pretty solid month. I hope you are able to get some more sleep. Looking forward to hear when you reveal the WKEC although I already suspect who it might be. Wow! Impressive job on the food budget. I’m jealous of your gas budget. When I worked a big city police department I had a 120 mile commute. I’ve cut that down to a 40 mile commute by shifting to a small department (best decision EVER), but it is still not $64/mo! Great job all around. Mrs. Tako commutes about 10 miles per day and we have fairly fuel efficient cars. During the week, I usually run errands … so considerably less than 10 miles per day for me. My thought was VLO when I first read about it. Nice job with the Chandelier and garden from discards! I had never seen that until your post a few weeks back. 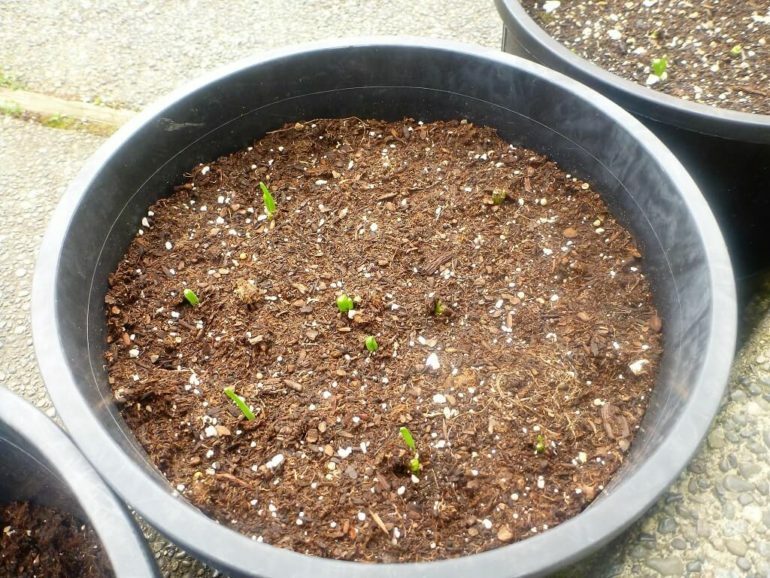 My green onions are spreading so I’m experimenting with transplanting them into different parts of the yard. How do you have $0 for insurance (car?) and I must look through your archives to see how you get your internet so cheaply. Thanks for the LYB tip and the website link to USeia, will check them out. We pay insurance like once a year in a big massive payment. Homeowners insurance is wrapped into our mortgage payment. I suppose I could break it out, but IMHO it’s not worth the effort. I’m new to your blog and like it a lot. You have very interesting material here! I’m working on being FI in a couple of years. Still trapped in the rat race for now, but starting to think a lot about ‘what’s next’ for me. I will look at LYB in more details. I’m a bit curious to know what is it you look at on the eia website. Lots of data in there but not sure how you would use this to make a specific investment decision. keep on the good ‘work’ ! That’s the trick — understanding how the world changes in relation to your investments. The EIA website is filled with TONS of data, but the changes that matter to investors will stand out. Humm… I know you are being cryptic on purpose, but they don’t stand out that much to me! (and to most people I guess which is a good thing because if they would the price of the investments would already reflect those changes.) The world is changing for sure about the way energy is produced and used but it seems to me that it is very difficult to make investments in this sector based on that. Remember all the talk about peak oil a few years ago? Without identifying the WKEC it would be great if you could do a post on your take of what those changes are and mean. Very curious to see your take on this. I have three words for you. Just three words. Liquid. Natural. Gas. Good luck with WKEC. For grins I looked that ticker up at Yahoo! Finance but it returns no results. If I ever launch a big energy empire I’m using that ticker when I go public! Very solid dividend income vs expenses. We are seeing more stuff growing in our garden too! Can’t wait for the weather to be warmer and drier. Today was a certainly a beautiful day. We hit 75F! Seems like you enjoyed a solid April with few surprises – the best kind of month from a financial perspective. Glad to hear you’re doing better with your attempts to sleep well. Heres to 20 good days in May! The Big Bet reference is a not so subtle reference to Southern Company. It has certainly done well the last 30 years. Really? That certainly wasn’t my intention to reference them. I Enjoy your blog – lots of good stuff. Hm…I wonder if the reason for your food cost going down is a simple change in recipes? I found that the more often I make soups and stews, the more our food bill goes down. If I make salmon, it immediately goes up. Good job on the expenses this month! It’s very possible it could be related to what we cook. Honestly, it felt like a completely normal month. It just goes to show — small differences can really matter. Still pretty curious about the WKEC, but I have my suspicions. Hope I’m right. Find it an interesting, and definitely bold, experiment. Other than that, I completely get the day-care decision, and the mortgage also for that matter. Looking at your other expenses, they are relatively small, and with the back up income from your wife you really have nothing to worry about. First time stopping by, awesome month! Investing $84,000 is a crazy amount of money to me to be able to just pull the trigger on. I just pulled the trigger on just shy of $15,000 and thought I was hunting with the elephant gun. Keep up the fantastic work! Good one – (WKEC) keep em guessing and coming! How do you track your expenses? What advice to you have for someone who is looking to start? Mainly I use spreadsheets. Nothing fancy, and no special services needed. 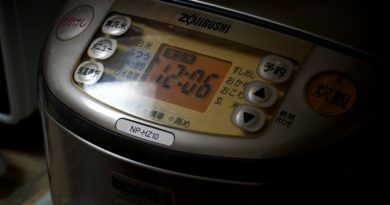 Just an hour a month to collect the data. Advice for someone looking to start? Start! That’s the hardest part! Great job on the Food expenses! We were doing great on ours for a while, but have been slacking lately. I budget $500 per month for the three of us. I think perhaps the craft beer is throwing me off some! Learning that green onions would grow even after being cut for use changed my kitchen habits entirely. I keep mine in a bit of water in my kitchen window. So fresh and delicious. Congrats on another great month. I’ll join the crowd wondering what the mystery company is. I’m glad you found a place to put some of your cash. You’ve been searching for awhile. Finding good deals is worth the effort.